Cub Scout, Boy Scout and Venturing Documents on line for downloading. Brought to you by BSA International lots of good information and resources. The site dedicated to helping Scouts become Eagle Scouts! Herein is a collection of resources to assist you in achieving Eagle Scout rank and planning the celebration to follow - everything from Eagle planning guides to extensive court of honor materials. The online companion to the Fieldbook. Additional resources and information. From barn raisings to soup kitchens, ordinary Americans have always made an extraordinary difference in the lives of their neighbors and in their communities by lending a helping hand. Today, America needs the service of its citizens more than ever. Hunger, lack of adequate shelter, poor health—these are issues that affect all of us. The Boy Scouts of America believes that we can do something about these issues—if we work together. That's why we've created Good Turn for America. Good Turn for America is a collaboration with The Salvation Army, Habitat for Humanity, American Red Cross, and thousands of other community organizations that focuses the power of volunteerism on these important community issues. It is a site about leadership, both adult and youth in the troop and Patrol. You even get around TUIT here. Online Version of the Guide to Safe Scouting. The directory lists all council-operated high-adventure trekking programs that span at least five nights and six days. More than 300 trails have been approved for Tiger Cubs, Cub Scouts, Boy Scouts, Varsity Scouts, Venturers, and family campers. This site is devoted to Scouting advancement. The National Scouting Museum is a tribute to the rich history of the Boy Scouts of America. Don't miss the boat! One of the most beautiful, and remote parts of North America offers a unique opportunity for Scouts. Canoeing, hiking, fishing, and winter camping in and around the beautiful lakes of northern Minnesota and southern Canada await you at the Northern Tier. 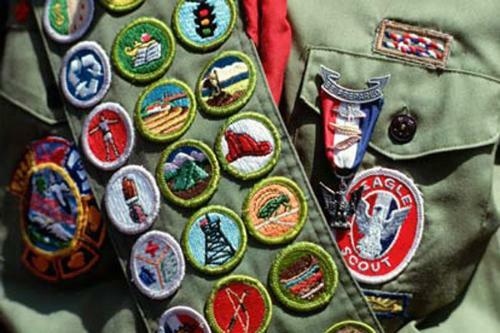 Patch-L is an internet LIST aimed at furthering the principles of the Scout Oath and Law in the hobby of collecting Scouting's patches, badges and memorabilia. Information on Philmont Scout Ranch. Powder Horn is a training opportunity designed to expose the Venturing or Boy Scout leader to activities and resources necessary to operate a successful Venturing Ranger Award or Troop High Adventure program. The Department of Homeland Security has come out with a new brochure and website to help families put together emergency preparedness kits. Unofficial guide to over 800 Scout Camps and High Adventure areas. Online pictures. The MacScouter's Songs for Scouts and Scouters collection. Lots of great information on scouting - just about anything that you need. Listing of interesting Scouting Facts such as games, internet resources, scouting lists, etc..
Online version of Scouter Magazine with archives. A portal for the scouting community including camps and camping, knots and lashing, games, songs, skits, crafts, projects, pow-wows, round tables, training, uniforms, and ranks -- from Tigers to Webelos, Tenderfoot to Eagle. Heard of a rumor or think that the story you heard is true - check it out on here. Resources for Scoutmasters and Scouters. Scoutorama is a Scouting resource warehouse. Information is continually added by the thousands of visitors who frequent the site every day. Great site for information about Scouting and how to do things. Dedicated to provide resources for to support youth groups around the world. This website is dedicated to the thousands of dedicated Scouters who call themselves Commissioners and give of their time and talents to help Scout Leaders deliver the best possible Scouting Program to youth members and to the Scout leaders they serve. This site is a resource for Scouters, providing a source of practical information and material to help scouting units provide a quality program. A search engine for Scout Sites.